The United States can ensure its relevance in Asia by strengthening ties with ASEAN. Now 50 years old, the Association of Southeast Asian Nations (ASEAN) is today a dynamic actor and a crucial partner in Southeast Asia, a region increasingly important to the world’s prosperity and security. Yet ASEAN member countries are concerned about U.S. commitment in Asia amid changing global geopolitics. The United States is reorienting its foreign policy by focusing more narrowly on American interests under the motto “America First”– which is characterized by transnationalism, unilateralism, and bilateralism. The U.S. decision to withdraw from the Trans-Pacific Partnership (TPP) created a wave of economic and strategic uncertainty across Asia. It has also largely affected the strategic credibility and moral legitimacy of the United States. Without a clear strategy and concrete actions and plans toward Asia, particularly ASEAN, the United States will lose its strategic leverage and influence the region, which in turn hurt Washington’s core regional interests. There are signs of U.S. reassurance toward ASEAN. 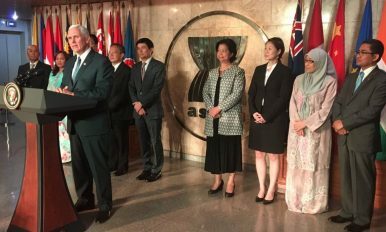 Vice President Mike Pence visited Indonesia and the ASEAN Secretariat to reassure ASEAN that the United States remains committed to the region. Pence also confirmed that President Donald Trump would attend the East Asia Summit (EAS) and ASEAN-U.S. Summit in November. Likewise, the special ASEAN-U.S. foreign ministers’ meeting in Washington DC in May signaled U.S. interest and commitment in enhancing ASEAN-U.S. ties. This year, coincidentally, marks the 40th anniversary of the dialogue relationship. North Korea, a key agenda item for the United States, is a useful example of how Washington’s Asia strategy needs support from ASEAN. After the 30th ASEAN Summit in Manila on April 30, Trump called the Philippine president, currently the chair of ASEAN, to seek diplomatic support from this regional body in pressuring North Korea to give up its nuclear weapons peacefully. ASEAN’s response to North Korea got a strong diplomatic point from the United States. ASEAN needs to strengthen its diplomatic leverage and security role beyond Southeast Asia, because ASEAN’s collective voice does matter on a wider multilateral forum. ASEAN’s regional architecture, fostered by the cultivation of comprehensive, strategic partnerships with international dialogue partners, is critical to peace and stability in Southeast Asia, and ASEAN’s participation in important global forums and governance bodies has attracted growing international attention and engagement. ASEAN has played a significant security role through promoting trust and confidence among states, facilitating dialogues and mutual understanding, and preventing conflicts. Trump’s administration has started realizing the relevant role of ASEAN in regional security issue but not yet in the economic realm. It will be a mistake if the United States does not pay close attention to the economic role of ASEAN in Washington’s Asia strategy (if it has one). The United States needs to recognize that ASEAN matters in both the economic and security sectors. ASEAN is the third largest economy in Asia and seventh largest economy in the world. ASEAN is the United States’ fourth largest trading partner, and the U.S. is the largest source of foreign direct investment to ASEAN. ASEAN member states de­fine their national interests primarily in terms of economic development. They want an inclusive and open regionalism in which all countries can benefi­t from regional cooperation and integration. Therefore, America’s Asia-Pacifi­c rebalance should emphasize economic opportunities for the people of ASEAN. Winning the hearts of the ASEAN people best serves the long-term interests of the United States in the region. Along with East Asia, the fast-growing economies of ASEAN have become linchpins of global production networks and supply chains. As a party to free trade agreements in the greater Asia-Pacifi­c, ASEAN is assuming an important role in shaping regional economic governance in Southeast Asia. The ASEAN-led Regional Comprehensive Economic Partnership (RCEP) comprises 30 percent of global GDP — it is going to be a game changer in Asia’s multilateral trade arrangements. Along with its strategic and economic importance, ASEAN is a role model of inclusive and open regionalism and a relevant global actor. To maintain its resident power in the Asia-Pacific, the United States, in addition to strengthening the alliance system, needs to proactively and robustly engage ASEAN, which is the most important inter-governmental regional body in the Asia-Pacific. With its future increasingly intertwined with ASEAN, the United States must maintain the momentum of its rebalance toward the Asia-Paci­fic, focusing on three pillars: comprehensive and inclusive security networks, economic integration and connectivity, and soft power and people-to-people ties. ASEAN member countries generally acknowledge the pre-eminence of the United States in maintaining regional peace and stability. The United States, as a Pacific power, has provided security in the Asia-Pacific region for the last seven decades. ASEAN welcomes the active engagement of all major powers in the region, but the continued presence of U.S. military, economic, and soft power is paramount to future regional stability and prosperity. Nevertheless, strategic rivalry and competition between the United States and China have created a security dilemma for ASEAN member countries. ASEAN member states are not interested in taking sides or being pulled into either camp. A stable and healthy U.S.-China relationship must be the foundation of regional peace and stability. The United States should treat ASEAN as a regional entity independent of its own China strategy. There are seven engagement policies that the United States should implement relating to ASEAN. First, Washington needs to make concrete the Sunnylands Declaration adopted at the special U.S.-ASEAN Leaders’ Summit in 2016. In the Declaration’s 17 points, the United States and ASEAN commit to firmly adhering to a rules-based regional and international order that upholds and protects the rights and privileges of all states. Second, the United States must continue strengthening multilateralism by supporting ASEAN-led regional institutions such as the ASEAN Regional Forum (ARF), ASEAN Defense Ministers Meeting Plus (ADMM Plus), and East Asia Summit (EAS). Third, the United States should develop a more concrete action plan to assist ASEAN in realizing its Vision 2025, particularly by strengthening the ASEAN-based regional architecture and promoting a rules-based international order. Fourth, the United States must continue strengthening its soft power in the region through implementing existing initiatives such as the Young Southeast Asian Leaders Initiatives (YSEALI) and U.S.-ASEAN Connect, which focuses on business, energy, innovation, and policy. Fifth, the United States should give more emphasis to the Lower Mekong Initiative by providing more technical assistance to the members of the Mekong River Commission, conducting scientific research on the impacts of climate change and hydropower dams, and developing measures to help people adapt when their livelihoods are threatened. Sixth, the United States should continue to support civil society groups in Southeast Asia that promote the values of democracy and human rights, rule of law, inclusive development, and social justice. Civil society plays a significant role in promoting a people-centered ASEAN, which is the ideal goal of the ASEAN community-building process. Seventh, education is the main bridge linking the people of ASEAN and the United States. The establishment of Fulbright University in Vietnam is an effective way to strengthen these people-to-people ties. The United States should consider establishing similar institutions in other ASEAN member countries, particularly those with the least developed economies — Cambodia, Laos, and Myanmar. Vannarith Chheang is a visiting fellow at ISEAS-Yusof Ishak Institute in Singapore.